Boon Khun Lan (บุญคูณลาน) is Month #2 of Heet Sip-Song – The Twelve Isan Merit-Making Traditions. Boon Khun Lan is a celebration of the rice harvest, and a thank you to all the spirits who helped. And since rice is life in rural Isan, this post-harvest blessing is one of the most important annual village events. 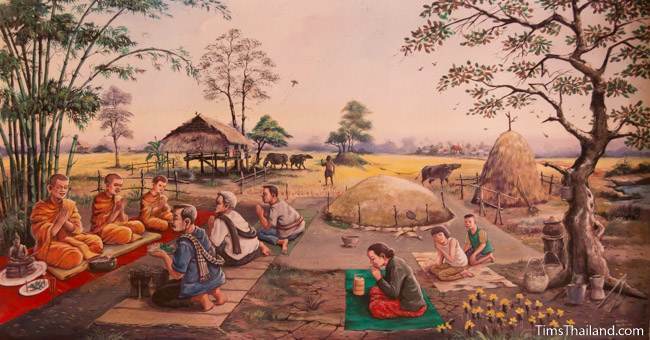 At the start, all villagers come together at some spot, usually either out by the paddies (where the threshing is done) or at a temple, and pour unhusked rice into a big pile (This is why it's also called Boon Kum Khao Yai: "The Big Rice Heap Ritual.") which is blessed by monks and then donated to the temple. After the rice pile is blessed, there are ceremonies to honor the spirits of the village's rice granaries, paddies (these ghosts are called Phi Ta Haek) and Mae Phosop, the rice goddess. Offerings are also made to ancestors. The Boon Khun Lan ceremonies should ensure a bountiful future harvest. Although these days most people use mechanical threshing machines to get the seeds off the stalks, in the past, when it was done manually, buffaloes, cows, and people would walk all over the rice seeds. So Boon Khun Lan was (and sometimes still is) also an apology to the rice goddess for this unfortunate necessity. In many villages, after the rice ceremonies are done, people go out to collect firewood to be used at home for cooking. Boon Khun Lan has no fixed date. It is often celebrated together with Boon Khao Jee or with Boon Pha Wet as a single festival.